Faculty, staff and honored guests joined in the Kogod lounge to formally open the Kogod Cybersecurity Governance Center. 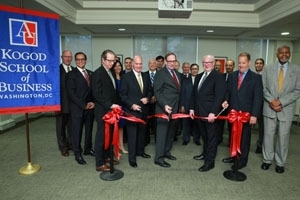 Earlier this month, the new Kogod Cybersecurity Governance Center at American University formally opened after a ribbon cutting ceremony. Businesses and individuals will benefit from this center by developing new policies to mitigate security breaches. "We are in a time of cyber economic warfare," said Gary LaBrance, president and CEO of the Association for Corporate Growth and guest at the ribbon cutting. "As the big companies become better and better at protecting their environments, the bad guys find it harder and harder to penetrate them. So what's happening is the bad guys are going down the chain to smaller and smaller companies and becoming problematic within the middle market." Hackers are moving on from large companies that tightened their security belts to smaller more vulnerable organizations that don’t have the same resources and access to technology. Kogod is focusing its efforts on these organizations' IT leadership and evaluating strategies to make their online presence more secure. The Center's goal is to detect security violations, prevent impending threats, prepare for potential attacks and respond to any breaches. Additionally, the Center will be conducting research on this program’s impact on businesses in the public and private sector. "This is a field and issue that will dominate board governance," said LaBrance. "This Center is the first of its kind to focus on cybersecurity. Kogod is a world leader in trying to establish new knowledge."